This module reduces the size of your Photos library by removing unnecessary supporting data. First of all, CleanMyMac deletes cache of the Photos app, which may use a big slice of the storage. For example, Photos always creates a full-size copy of the picture after you have edited it. So you may keep numerous copies of your photos even if you simply rotate them. With this module, you can also delete Faces cache files and local copies of iCloud pictures. Removing these photos doesn’t affect their originals in the cloud, and you can always access them when online. 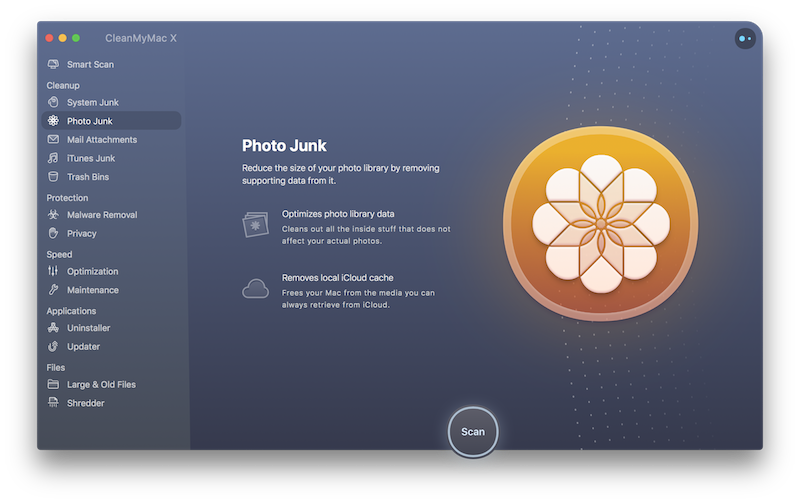 Scan: Navigate to the Photo Junk module and click Scan. Faces cache: While you work with Faces, multiple supporting files are created. These files are fully recoverable, and their removal does not affect your experience in Photos. Photos cache: Photos creates several types of cache files that are absolutely safe to remove. Every time you launch Photos, they get regenerated automatically. iCloud local copies: When you open iCloud via the Photos app, copies of all images you've viewed get stored on your Mac. CleanMyMac removes only these local copies and does no harm to originals. However, files of this type are not selected for removal by default because next time, you'll need an Internet connection to view these images in Photos. By default, CleanMyMac selects for removal Photos cache files and Faces cache files. They are recovered automatically when needed. Switch to the Photo Junk module on the Ignore List tab.